Well here we are at Day 23! Keep loading your tags into the 25 Days of Christmas Tags Flickr Group, they look fantastic. I have three very sweet and extremely talented designers joining me today. 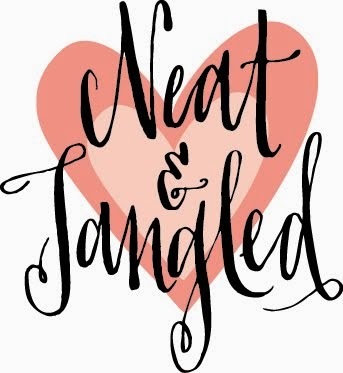 I am sure that you already know all of the them but if you are not familiar with them please take some time to check out their amazing blogs. My tag today is also combined with the new Cue Card at CASology! Here is my tag for today, yes I know I have a thing for jingle bells!! A simple tag, black with gold embossing and a spritz of gold Color Wash.
For a chance to win one of the prizes leave me a comment here. Thank you Lynn, Karolyn and Annette for sharing your talents with me today as my guests. Don't forget to comment on all of their blogs for another chance to win! So happy to be playing along with you! Love your gorgeous gold/black/kraft tag. The touch of shimmer is so elegant. FABULOUS tags again today - I still can't believe that we are ALREADY up to Day-23 and that there are so many different designs coming through, the INSPIRATION is endless - WOW!!! 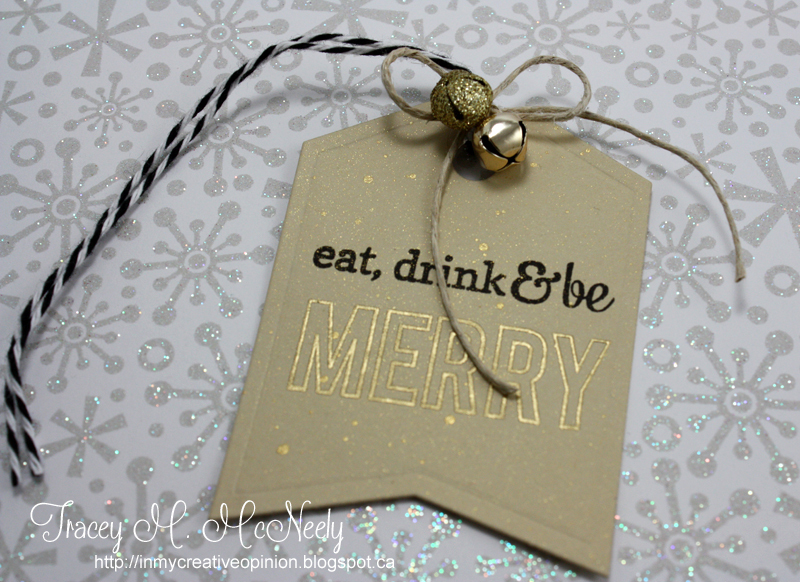 LOVE your ELEGANT tag Tracey, LOVE the black & gold & bells, LOVE how you used the different colours for the sentiment, it makes the MERRY pop!!! Wow wow wow!! These are all gorgeous!!!!!!! Total eye candy. Can't believe the "wow" effect of Karolyn's tag. So much to love on one tiny tag. Tracey, your tag is simple yet oh so stunning! You can never go wrong with black & gold and I really love it on the light kraft cs. Thank you for your kind words yesterday & got pointing out that I do have blog space--I'd forgotten the address! All are so cute and so clever. Especially want to try Karolyn's present gift tag. Love her colors and I love your jingle bells, Tracey. Love the tags featured today! Very pretty! wow beautiful tag of yours!!! 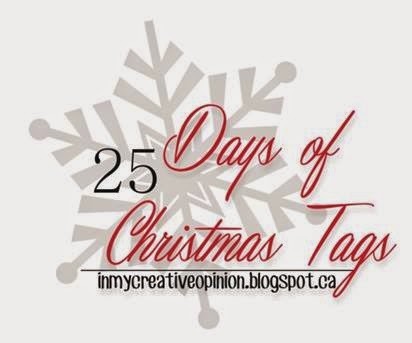 aww thanks again Tracey for letting me a part of this fun 25 days of tags.. loving all the inspiration.. Cute collection of adorable tags ... your black & gold jingle bell tag is very elegant! Love the tags today. The kraft and gold is stunning. I need to get some jingle bells and start adding them to my projects, they are such a festive touch. Awesome tags from your three guests today, Tracey and yours is so beautiful with the gold and jingle bells! So many fun, clever tags today Tracey! 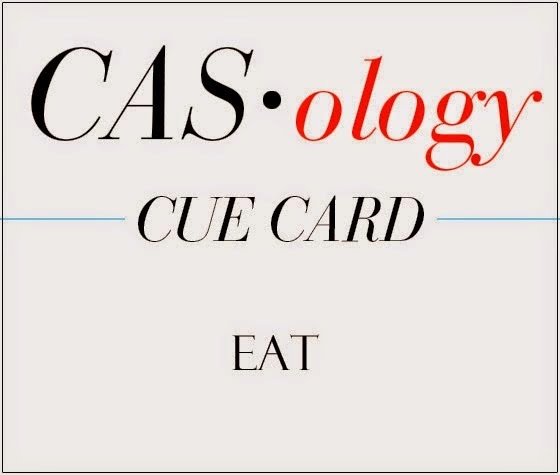 Love your elegant take on this week's CASology cue card! So many fun ideas today! Awesome inspiration. Each of these tags are fantastic. I can't believe we are on day 23 and this series is almost over! I will miss coming to your blog everyday and seeing such wonderful tags. thanks for having the hop. I know it's a lot of work but its been appreciated. The designers' tags: fabulous; yours, amazing, as always! Off to see everyone's tags up close and personal! Beautiful tags by your Guest Designers, Tracey! I love how you played with the Cue Card on your tag today...so clever! Beautiful shimmer on your sentiment and splatters, and your jingle bells are so pretty! Oh, these are all wonderful! I especially love yours, Tracey -- it's gorgeous! Love the tags! Yours is simple, but stunning. I came in LATE to the party.. BUT I have enjoyed catching up! LOVED all the tags.. such FUN ideas!!! Fabulous and very inspiring tags! So many wonderful tags, and even more today. Your tag looks great. I love those little jingle bells too. I found some in my stash and I am going to put some on my tags. Your tag would be perfect for food and wine gifts. Great idea. I like the simplicity and the fun elegance. what beautiful creative designs on all these tags! Tons of inspiration today! I love the neutrals + gold on your tag! The bells are perfect! Seeing them makes me merry! Gotta love low-cal merriment! Thanks so much for sharing and for inviting all these wonderful guests to share today! Tracey, I really must pay more attention to these tag posts of yours! What inspiration!!! This is so much fun. I am being inspired by all of you creative ladies. loving all these great tags! Love all these tags! Can't believe how we're almost through 25 days. Oh my gosh, that tag with the bells and gold is gorgeous!! 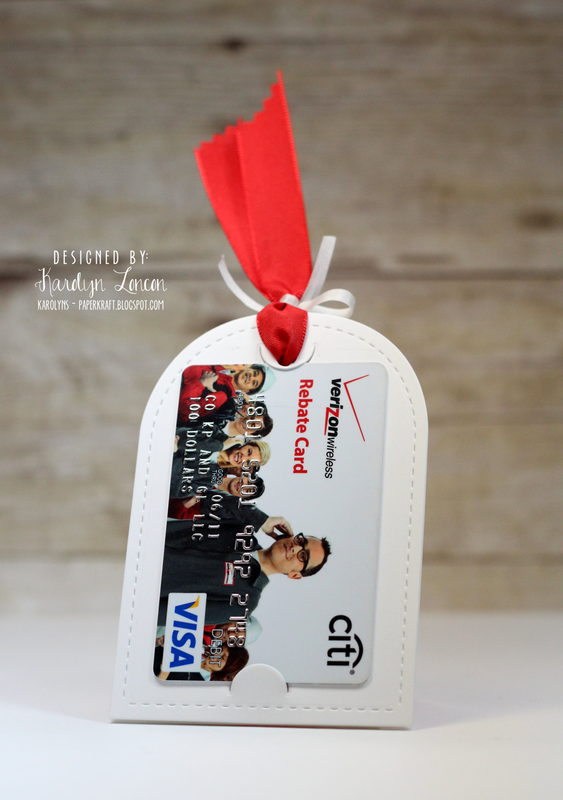 love the gift card holder and every tag here! Love gold on kraft!!!! Such a gorgeous tag! Another day of awesome tags! Wow! This is an amazing collection of tags! Love them all! Star studded cards again today! I love them all--I have been enjoying all the tags so much, thank you! I love this gold tag! 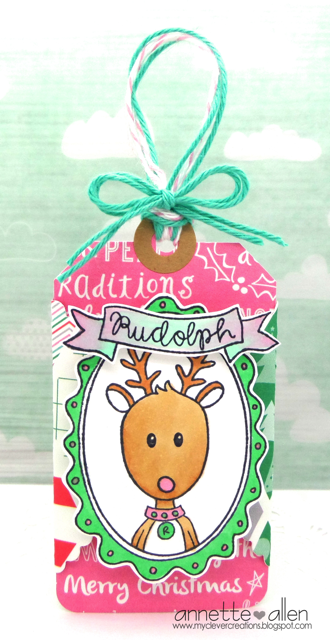 Love the trees tag and presents tag! Thanks for sharing! Fabulous tags by all three guest designers! Yours is gorgeous--love the black & gold on kraft--and those sweet jingle bells!! all the tags are sooo cool!!! the gift card is so clever!!! Absolutely love your gold tag. More wonderful bits of inspiration today. I just love the variety of these tags. Such talented ladies! Love the black + kraft + good combo on your tag, Tracey! Cool tags ladies. Tracey, love the bells and the touch of gold on yours. 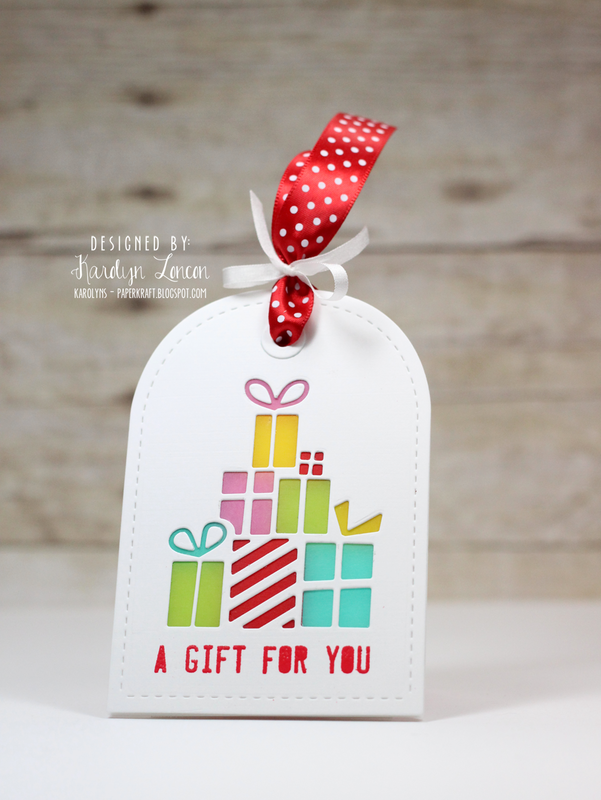 My favorite tag today is Karolyn's tag with the gifts....gorgeous! Wow...too cute! So much fun and so many fabulous and fun tags. All great tags again. Tracey I am in love with your tag! Another day of cute tags. So pretty and elegant ! I really adore your tag. No one would ever throw that away after Christmas. That is a gift in and of itself! Beautiful!!! Tracey, all of your guest designer tags are amazing, but your gold/kraft tag is my favorite of the bunch! Beautiful!